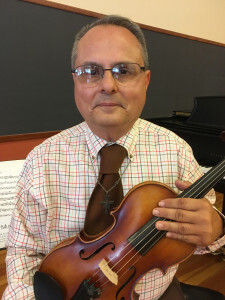 Michael, I am very happy to meet you as we are both members of the Secular Franciscan community and both string players. As you know my research is on “inner song”. Some say inner song is “my body,” “my memory.” Others say it’s “the moment before I begin to play.” What does it mean to you? The song within my heart starts at the moment the conductor gives the downbeat. I feel something deeply inside when I begin to play, something that is beyond description. At the same time, I feel both the acts of creating again and creating anew. Both feelings mesh with each other. Those feelings lay on a continuum, being expressed as both a participant in and a consumer of the music. As I move through the music, I will feel things from within, one of which is a sense of beauty about the music, and also, feelings coming from the outside—from the musicians surrounding me– defying description. I get a sense for what they sense; I feel their own pain as I feel the pain in my fingers, hands, and neck from playing my viola. There is a unity, as a chorus of string voices come forth and merge into a hymn of praise to the Lord. I never like to leave our rehearsals, because as we are getting to leave, it is just starting to get good! I wish I could play on forever like the angels do. For us, it’s just not possible because we only have so much strength. There are indeed times when I am nervous before setting the bow on the string, as the awesomeness of the music comes into my thoughts. For example, let’s turn to the music of Mozart and listen to his famous work, Divertimento. For me, this piece—as well as so many others– has technical challenges. To play it well, my mind searches for what I have learned from my mentors. A first, a feeling of apprehension takes hold. Am I going to stumble? It’s only because I can feel strengths coming from the other players that the apprehension is eased and my own playing blossoms forth. It is connected with a sense of community. However, if I could reformulate, could I say that for you, inner song is first of all a feeling? The ‘inner song’, the song within my heart, is a feeling that I have never understood. The first time I felt it at age 8, I was standing in front of the statue of Our Lady of Lourdes. Something moved within me. There is no describing it. You cannot wrap your hands around it. It’s just a feeling that something is happening out of my very being. The next morning the feeling touched me again and, out of the blue, I started singing! I had never sung before. There is neither reason nor rhyme to it. It simply happened because it happened. You are a singer, too? Yes, I am a singer. The root of your inner song is a spiritual experience? Indeed, it is. I was uniquely gifted so. At that precious moment in the Grotto of Our Lady of Lourdes, my mother and sister were praying in front of the statue of Our Blessed Mother. While standing in the back of the room, a sense of wonder and awe suddenly came over me. My inner song was born! So, nobody does any music in your family? I am the only one who made it a career of sorts. I want to sing for a congregation. When I am at the ambo, facing so many people, I think I am holding their hearts in my hands. For a couple of minutes, I will bring the psalms of David—Christ’s own prayers– to them. I really like the sung part of the liturgy. So, I am very involved in liturgical ministry as a cantor. The connection that you bring between heart and music interests me because in France we use the expression, “playing by heart”? For us it means, “memorized”. It’s as if the song has entered into your heart. At this point the music score is not necessary. How do you think that your prayer influences your music then? Do you think that because you ask God to help you your song is different? Why do you pray before you sing? Opening your heart to God through prayer is what the Mass is all about— connecting with the Lord. I am asking Him to let me bring His word to His people. And everything comes together in a moment of serenity. I can feel the rhythm and tones of the song. It all makes sense then as I speak in not my words but rather the words that God has given us in his Word, the Holy Bible. So, when you do it in this way, you become a servant, and you are not exhibiting yourself? Definitely a servant. That is all I ever wanted. That’s why I became a Secular Franciscan. I just wanted to be a servant, living and working in simplicity. So, your intention is the same in music and in the Secular Order? Yes. All I ever wanted to do was serve the Lord. So, it’s being available in some way? Is the Lord calling you to action? Yes, it’s a call to action. The action is doing what one is asked to do. If I understand well, for you, there is a strong correlation between this Secular Order and your approach to music? Yes, there is a connection. I could not be happy with just one or the other. I have to have both to be happy. So, I am fulfilling my mission in life in bits and pieces. Sometimes I just do not know what the bits and pieces are, but I try to do the best I can with what I have. So, God is asking you to do something with your life, and you just have to figure out what He is asking you to do? Yes. What am I called to do? A lot of the things He has called me to do I did not want to do. Being in front of a group and teaching is an example. I get tired being in meetings. Dealing with people’s problems is something I am not fond of. But, in every situation, I ask for grace from God and it is freely given to me. Then my heart again begins singing a wonderful song. At those times, which happen so very often, difficult tasks become easy. Then, all of a sudden, teaching, meeting and helping people become a joy. Did you have that same “I cannot do that” feeling in music? Absolutely yes. As I have said before, as a case in point, the music of Mozart looks easy but presents technical challenges. I am often reminded of my shortcomings as a musician. As a young music student, some forty years ago, I could not shift from one position on the viola’s finger board to another—it was too difficult of a concept. I could not play in tune no matter how hard I tried. Although I took lessons at Carnegie Mellon University from tremendous teachers I was still a bad music student. It was youthful foolish selfishness that disconnected me from the song in my heart. In fact, I stopped playing viola for 35 years. In 2006, a letter came –out of the blue– asking me to play in an alumni concert with the Pittsburgh Youth Symphony Orchestra. The indescribable, mysterious feeling that I had at age 8 in the Grotto of Our Lady of Lourdes came back and took possession of my heart. As a kind of penance, I practiced and practiced and practiced to make up for what I did not do as a young student. Then all of a sudden, I was making those shifts and playing with perfect intonation. It happened through the grace of God that came from listening to the song in my heart! What a shame that not until my middle fifties that I could play well enough to join a string ensemble! So, you didn’t have good technique when you were young, and you came back and started again? No, I did not have much of any technique as a young fellow. 2006 was the year when I started anew, resolving to be the best violist I could be. When not playing the viola, or singing, I felt a deep emptiness. For 35 years, I did not hear the song in my heart and felt loneliness, like someone you have loved has died. As a young person, I started out well, but, as time moved on, I felt shyness and lost confidence. My technique went down hill as my fingers and hands felt more and more tense. It is also helpful to play with a group of string musicians, hearing their mistakes and learning from them as well. One thing you must learn to be a successful string play is playing in tune, keeping your fingers “tight” on the fingerboard and homing in on the correct tone in whatever position is required. You have to have humility to accept criticism and you have to work hard to achieve the success that comes through discipline. When musicians first come together to practice, it’s like a group of children coming to play. The practice session is kind of like the process of children growing up. You learn when to come in and when to rest and how to play in tune with the correct chords. You learn where to place your fingers on the fingerboard to the point that you almost do not need the written music. All of a sudden, the children are grown up and are making beautiful music. The pleasure you get as a musician is in seeing the delight in the faces of those in the audience, knowing that you have given them joy. Yes. Doing something good for someone else makes their life so much better. You may not know anything about someone’s life but you know you have made it better by generously sharing some beautiful music. Music and our spiritual lives both are about commitment and justice to the Lord. Both music performance and religious worship is a way to give something back to the Lord, who has given us so many gifts to begin with. We commit to playing beautiful harmonious music, we commit to receiving sacraments– we commit to living a life of faith. Sadly, in so many cases, people–both young and old—cannot accept this view. I think it’s also because commitment means going outside of yourself, and many times we feel that we can’t do something or we can’t trust something outside of ourselves. It’s the same with vocation, when we commit to something that is not just our own will, but the result of something (or someone) calling us. Yes. Do you think that you feel more confident in music because God is giving you the strength that you lack? Yes. When I am singing or playing the viola there have indeed been times when I wanted just to give up. Then I say, “God guide me!” –and things begin to come together like magic. I move that finger because it’s God’s grace given to me. And when it comes time to sing a tone I do it because God is telling me, “Just trust me.” It’s all the grace of God. Why do you think He does that? If left to my own will, nothing would get accomplished; I would simply sit on the sidelines of life, kind of like sitting at a stop light. But God calls me to push the gas pedal and get moving, simply because it is His will. When I get into the detailed parts of a music work, I start to hear the music in the music. I start to understand just how special the gift is of having something on paper. It’s kind of like what we have in the Bible, something divine that is on paper that is part of creation, and a gift that someone took the time to respond to God’s call to put it down on paper. And just as we listen to the Word, we listen to the music. Music is how we decorate and appreciate time. We need to appreciate the time that we have, and the central message in music is that time is all we have in this life before we move on to eternity. The awareness that we are called by God to do His will moves us further and further as we move through life. So, I think you don’t go into music only by yourself. Someone leads you to it. It is definitely that someone has influence on you. It’s like faith. That you get it from someone. It is like a living thing. Yes. My faith comes from my mother. Yes, I have two children who are mentally retarded. They live at home with me. They were born that way, but their lives are just as valid as anyone else’s. I think the relation between faith and music is that, without faith, music is not possible. We might not be able to create music of our own accord, but we can ask for God’s grace to so. St. Thérèse of Lisieux said it simply: “I cannot smile, smile for me. I cannot be joyful, be joyful for me.” Jesus carried her and carries us through life in the same spirit. Another way of saying this is “it’s not me, but Christ living in me.”. I always ask for a tender heart. I find the competitive nature of society to be very draining. Life can certainly be hard at times, but we cannot harden our hearts to the extreme where we are insensitive to pain and block out that goodness that is all around us. For me, when it comes to the viola, it is one thing to just play your line and get it right. The hard part is making that viola sing. The hard work is finding how to be expressive, finding a way to reach the feelings of the listener. That song that comes out of the viola is really the song that God put in my heart. God has put that song in my heart. I can see how much of a gift it is to both play a stringed instrument and sing, and that there is still more I can do with my gift in the time I have left in my life. It’s so beautiful what I have, and music is how I am able to appreciate that. God’s life inside us is that song that comes from our hearts. His voice, God’s voice, is what we share with others when we share the song inside us. And that sums it up! Thank you very much for this beautiful discussion Michael ! Good luck with your viola and see you soon!